Betin Casino does not have some tremendously appealing design. The main page looks very plain. However, the inside content is what matters the most. It is easy to see that the game offer is quite extensive. There is also a large list of winners, which indicates that the casino website is active and delivers plenty of prizes. The graphic previews of the present games have been shown for all to see. Unsurprisingly, the live versions of the classic casino games serve as the main attraction here. So should players flock to the place and put down real money, or is it better to avoid the venue? The promotions section is not extremely informative. Instead of providing a description of the available deals, the section talks about the virtues of various games and new additions to the game offer. While this information is interesting, it is largely irrelevant for a player who is looking for fresh deals. There is not a single real promotion that can be relied upon. Perhaps the absence of deals is a temporary thing and the reviewer simply had bad luck. If it isn't just a short-term problem, it could be a potential disaster for an online casino. Betin Casino Bonus deals are supposed to be the engine of the whole project. Thankfully, the player who is about the make a deposit can immediately see all the deposit options. They are all listed at the bottom of the main site. Here are the ones that have been mentioned so far; Visa, Visa Electron, Maestro, Skrill, Postepay, PaySafeCard, Neteller, EcoPayz and Bank Transfer. 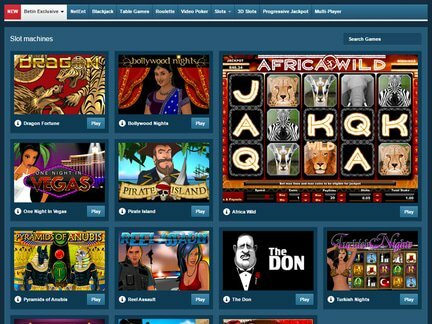 The website isn't just known for offering casino games. It has achieved some success as a sportsbook as well as a bingo venue. Multiple languages are supported on the Betin Casinio site. Here are the languages; English, Italian, German, Bulgarian, Serbian, Albanian, Romanian, etc. Bets that come from the following jurisdictions won't be accepted; United States of America, Latvia, French Territories and the United Kingdom. The website currently accepts registrations from many different countries. The European players are strongly represented here. There is no separate category for popular games. However, a number of popular games (games that have always been getting a lot of traffic on casino sites) appear in the game display window. The following games can be encountered by the player; Spinata Grande, Dracula, Gonzo's Quest, European Roulette, Classic Blackjack, Jacks or Better, Red Dog, Punto Banco, Pirate Island, Classic Baccarat, etc. The players can access games from well-known software providers such as NetEnt. Since the website has the highest payouts, it does not receive as many complaints from players. Furthermore, the site has no max bet limitations. When a a complaint appears, it typically has to do with with some minor issues. Players are easily reach the staff using toll-free phone numbers for different countries. There is also the possibility of contacting the staff via e-mail. The online casino is licensed in Curacao. The eGaming License isn't reputable. This Caribbean licensing body has a low level of trust. It also does not have a good track record when it comes to player assistance. Unfortunately, it has never appeared on the „white list", a source of trusted list of casino regulators. This casino site has been operating since 2010. I could not rely on the Betin Casino's license. The Curacao body has a fairly bad reputation. However, I was able to find a number of interesting games on the website. I was particularly drawn to the classics. In my opinion, the promotions section was the least attractive aspect of the casino. It lacked any meaningful information about the deals that can be encountered on the website. Therefore, I am not sure whether the casino will be attractive to people who are searching for good casino deals. It did not appeal to me.